Looks like it's the season for renders of the upcoming LG G8 ThinQ phone: not long after we saw some unofficial designs of the handset from 91Mobiles, we've now got a new image to pore over as we count down the days to the handset's launch. This time it's the usually reliable team at XDA Developers that have offered up a rendering of what the LG G8 ThinQ is going to look like. The design doesn't differ too much from the earlier renders, which is to say it looks to be along the same lines as the LG G7 ThinQ as far as the appearance of the smartphone goes. One of the innovations tipped to be coming to the LG G8 later this year is Sound on Display technology, where screen vibrations are used instead of a speaker. That should free up some notch space, but here the display notch looks the same size as last year. It's worth bearing in mind that Head of LG Electronics global corporate communications Ken Hong has already dismissed the earlier renders as "speculative" and "not real", so take these pictures with a grain or two of salt for the time being. That said, these sources tend to be reliable when it comes to leaks about upcoming phones. XDA Developers says an "anonymous source" provided the design templates for the rendering, although no new details of the phone's internals are provided. The phone is being tipped to come with more advanced facial recognition, though. 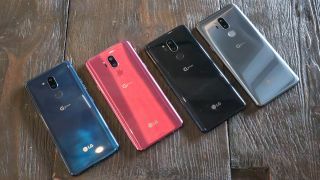 We'll know for sure when LG officially unveils the LG G8 ThinQ, and that should be at the MWC 2019 show at the end of February. Before then we're going to see what Samsung has been doing with the Galaxy line at its own event on February 20.